Custom Sign / Label - Create it! 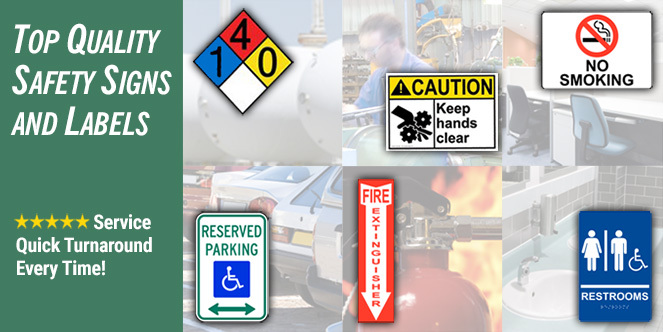 Our extensive selection includes signs, labels and mounting hardware in a variety of sizes, colors, languages and materials to meet your needs. Our signs meet relevant regulatory standards including color, text, symbols, tactile, Braille and material. 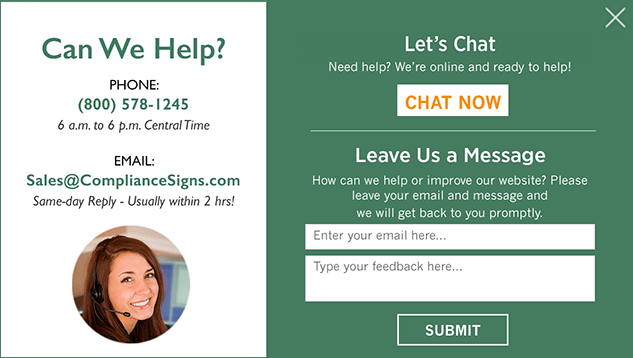 We've also made it easy to design, preview and order customized signs online. Use our custom sign generators to select a style, add text and symbols, and choose colors to create the sign you need - including printed, engraved plastic and ADA Braille. Or contact us to make fully custom signs for your specific needs. We accept all major credit cards and authorized company purchase orders, with volume price discounts available on most products. Your signs and labels will be manufactured using state-of-the-art graphics equipment, and most orders are shipped within 2 days. Shop our store or contact us at (800)-578-1245 or sales@compliancesigns.com. We are happy to assist you with all your compliance sign needs.